After we first chanced upon this gorgeous piece of music gear at The Palm Expo 2017 in Mumbai, we have been eager to give this a patient go. 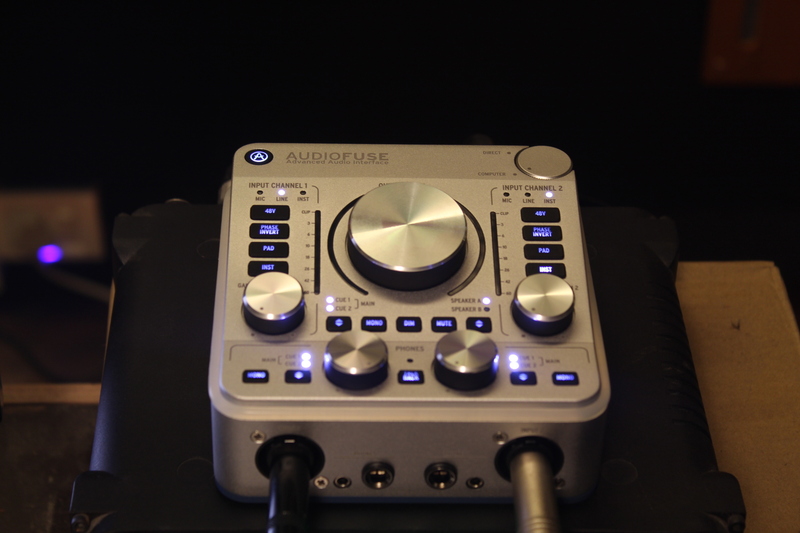 We’ve had the newly released Arturia AudioFuse servicing our aural needs for the last one week at our studio, thanks to the good folks at The Inventory. We ran it through a few tasks to juice it out, record audio from hardware synths, A/B between our sound card and the AudioFuse, and we put together 13 reasons why this could replace your current audio interface. So small you can carry it in the back pocket of your baggiest jeans. So portable you’d want to take it everywhere you go. Weighs in just shy of a kilogram at exactly 950g. Got a bunch of friends with synths or guitars and wanna jam it out over the weekend but too lazy to connect this to a computer? Just monitor directly with a twist of a knob or use this feature in the studio or on stage to simply preview or play your hardware sounds over the mix without the need for a complicated I/O setup on your DAW. You can also blend between direct volume and computer volume. The audio output is pure bliss. Our Dynaudio LYD8 speakers, here in the studio room sounded more ‘open’ with the AudioFuse when compared to another similar audio interface. Beware, dates multiple partners. Hook this babe up with almost anything. Great set of features as expected on the OS app, you can control all the same features plus a few more like Sample Rate, Clock Source, Pan, Mono-Stereo Link just to name a few. Pretty much everything you’d need to access frequently is right on the panel so no worries there. Imagine this. You want to tell your voice over artist to speak louder but he can’t hear you through the glass pane of the vocal booth. But would you walk over all the way into that other room just to tell him that? Hell no. Just use the Talkback button with the built-in microphone instead. A much-needed physical button to switch the output to mono on-the-fly? I’ll take it. No more utilities on the master channel, just flip the switch instead. This is a huge plus. No more regrets about losing that often treasured 3.5mm-6.5mm jack at the gig last night. Maybe, just maybe. Try re-amping some of your favourite VST presets or your trustworthy analog synths. Users looking for a DC coupled interface might be a bit let down as this isn't one. Otherwise, there's more reasons than listed here for this to be the center piece of your audio workflow.